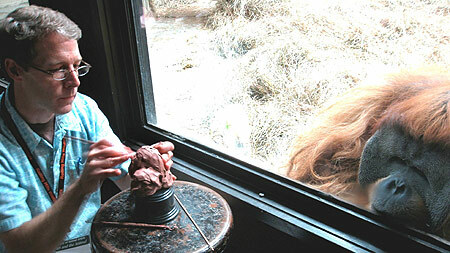 I have been creating wildlife sculpture in one form or another for over 35 years. Ataround twelve years old, I taught myself how to do taxidermy. That, along with an insatiable desire to learn about wildlife, I drove my family crazy with pets ranging from raccoons to rattlesnakes and the occasional unmentionable lump in the freezer in the basement. I started my professional career at the Schiele Museum of Natural History as an assistant curator. I quickly grew tired of making leaves for dioramas and retired at the age of 20. I was intent on becoming a sculptor, so, I started sculpting mannequins for the taxidermy industry. Over the course of twenty years, I sculpted approximately 300 animal mannequins ranging from deer mice to Cape buffalo. As a sculptor, it was a wonderful experience. I had the opportunity to study animals around the world in the wild, then, come home and sculpt life-size anatomical portraits. I describe myself as an artist whose subject matter happens to be animals. Any mood or emotion can be expressed with animals as well as complex compositions. My goal is to capture the essence or personality of the subject, not just an accurate anatomical replica of the species. I have spent much of my life studying animals, the more an artist knows their subject the easier it is to push the envelope to achieve a truly expressive piece. The majority of my work is sculpted in clay and cast in bronze. I like the freedom clay gives me to create texture. For me texture is about the reflection of light, not an attempt to simply recreate fur. I am a lifetime resident of North Carolina. My studio and gallery are located in historic downtown Albemarle near the Uwharrie National Forest. My work has been in exhibitions around the US, including the National Sculpture Society, Brookgreen Gardens and The Society of Animal Artists. 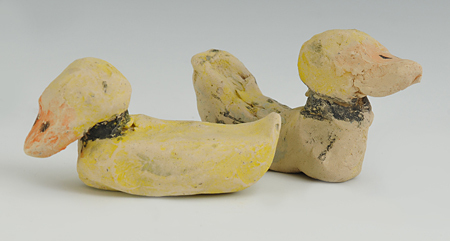 These two ducks are the earliest sculptures I can remember doing. I think I was around six or seven years old. My aunt gave them back to me recently. I guess I’ve always had an interest in wildlife…..